I loved this movie as a kid, and I still do today. It’s the story of Don Hewes, whose dancing partner, Nadine, has broken both his heart and their duo to star in her own show. In a moment of excitement due to a broken heart, anger, and alcohol, he declares he could turn any one of the chorus girls dancing at the bar into Nadine, and chooses Hannah Brown. Over the next year of their life, Don and Hannah struggle to make their act work, as well as their relationship. It’s a story line that has been done over and over since, but what I find unique about this version is that instead of going purely from Plain-Jane to star, they make it their own. Instead of turning Hannah into Nadine, Don simply turns Hannah into a star of her own. I love the writing. It’s full of great lines throughout the entire film. I appreciate the film so much more as a whole now that I understand it in its entirety. There’s just a different level of understanding when you actually pay attention to the dialogue. When you watch movies as a kid, you either remember what was funny or what scared the pants off of you in regards to films that weren’t geared toward your age group. (I always remembered the scene where the waiter Francois pretended to make the salad.) Now I see all the convoluted love triangles going on at once, every ounce of frustration between everyone, and who’s being sneaky. But it’s also visual. At Don and Juanita’s first preview Hannah is in a light blue dress similar to the one we’ve seen Nadine wearing with the stringy feathers on the sleeves. Not only is Hannah nervous and messing up the routine, but the dress itself is a disaster, symbolizing the state of their act. The sleeves are in Don’s face, the feathers are flying everywhere, and it’s just not as elegant as it originally looked. She looks like Nadine, but it’s clear she isn’t. We see Don’s frustration in trying to turn Hannah into a ballroom dancer, and we see Hannah’s voice get lost amongst Don’s expertise, but it isn’t until Nadine points out that Hannah is imitating her that he gets it. He immediately goes back to start with Hannah from scratch. This movie is painted with so many colors, I just love it. The songs are catchy. The dance numbers are infectious. The writing, the actors, the story; I can’t find anything in this movie I don’t like. And you just have to love the Astaire/Garland pairing. I really wish they had been able to co-star in a few more films, but it never happened. They really are a delight together, and both of them are brilliant in their own right. Anyone who is a fan of classical musicals would love this film, as proven by the fact that it was one of the highest grossing films of 1948. 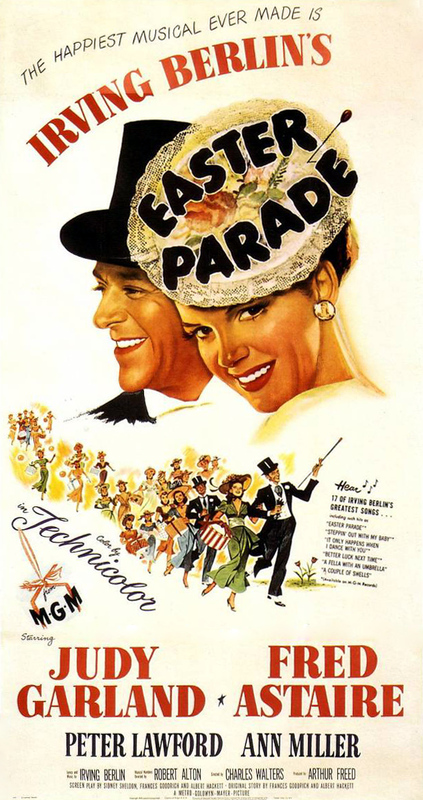 This entry was posted in musical, NR, romantic and tagged 1940s, Ann Miller, dancing, Easter, Fred Astaire, Judy Garland, love triangle. Bookmark the permalink.